The intensity of Michael Gerber's smooth baritone is a perfect match for this powerful lesson on the inner game of starting a business. Urgent and confident, Gerber's performance makes this production hard to put aside. His insights on the entrepreneurial mind describe how explosive creative energy and a moment of clarity are essential for any truly new business idea to appear. And once it does, he shows how the four roles of an entrepreneur - dreamer, thinker, storyteller, and leader - can advance that idea and earn the enthusiasm of employees and customers. In Gerber's hands, the feeling, thinking, and action components of entrepreneurial success have an energizing clarity that will awaken even complacent dreamers who fear there's nothing left in the tank. These words have been defining the life of Michael Gerber, best-selling author and international small-business guru. Now he's created a new organization, In The Dreaming Room, as a place where entrepreneurs and future entrepreneurs come to discover how to make their dreams a reality. No practical advice or tips here. This book was an infomercial for Michael's venture, "The Dreaming Room." Don't get me wrong, I love the E-Myth. This just wasn't what I was looking for. Would you try another book from Michael E. Gerber and/or Michael E. Gerber? What was most disappointing about Michael E. Gerber’s story? If you could play editor, what scene or scenes would you have cut from Awakening the Entrepreneur Within? I loved Emyth revisited, but this entire book is him trying to sell his courses. No worthwhile content. Overall the book was good but I felt there was a little bit too much promotion of one of his businesses "who is Manny Espinosa". You will need an open mind for this book. You either get it or you don't. But Michael Gerber although a little different knows what he is talking about and if your like any of his other books you will like this. In true Michael Gerber style, this book provides easy guidance for those of us who would really like to follow the 'Entrepreneur Within' each of us. If you have some great ideas and need to know how to turn those great ideas into a reality then this book is for you. It is not a complete Step-by-Step guide, but more the book that you need when you want to create that inferno within yourself to turn your idea into reality! Micheal...what the hell where you smoking??? Bummed, confused, WTF. These are the things that come to mind with this "book" (aka BLATANT INFOMERCIAL CRAP HYPE) from one of my biggest heroes Michael Gerber. A huge disaster. Dump the white suit and bring back the blue suit and red tie. We miss you.... but still love you Micheal. 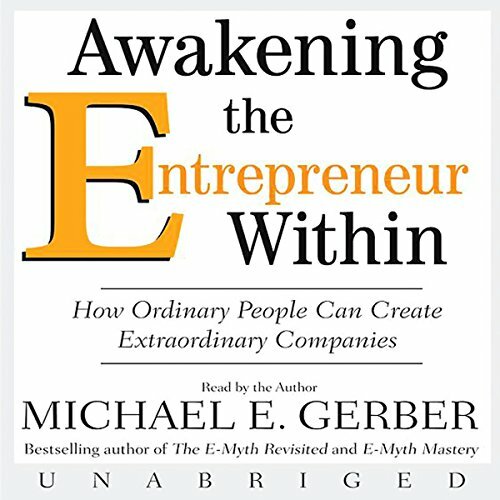 Considering myself a serial entrepreneur I was fascinated by how well Gerber tells the story of how he became who he is. I would recommend this book for anyone either considering starting their own business (even in the dream stages) or those who have been in business for years and need a subtle reminder that they are not alone! I'm a big fan of the simple principles of Gerber and his classic book The Emyth Revisted (not on audible) but that is the only one worth reading. The Awakening The Entrepreneuer is very poor, rambling, repetitive and just a plug for his courses, a pale shadow of the real Emyth title. This is a case of a great one book author with one great message to impart spreading his brand name into areas that don't work. Trust what other reviewers are saying as well and get your business buidling inspiration elsewhere. I loved emyth revisited. I gained a lot from it. In the Awakening the Entrepreneur Within Gerber promotes the sevices he offers. One of this is the Dream Room for $5000. Greed got the worst of Gerber. I have now lost trust and respect in him. When I buy a book I do not expect the writer to promote his/her business. I am not paying for their advertising. Please do not buy this book it really is waste of money and most importantly your time. This an excellent listen. Michael Gerber's tone is soothing and easy to listen to. This book does not hold the answers but might help you to find the right questions. It is not the E-myth Revisited again, although that is referenced throughout, but arguably you want to listen to this first to determine your direction. This is more about the What and the Why, whereas E-myth might be the How? The case study within it is a little confusing until you realise that it perfectly demonstrates how your dreams can take on a reality and the benefit in taking the time to flesh them out. I would highly recommend that you listen to this. Sit down and think about it. Then listen to it again.